Is the Earth Hollow? . . . And if so, What Waits Below? This intriguing question has attracted the attention of free thinkers, scientists and a wide assortment of crackpots back through the ages. Plato wrote of enormous subterranean tunnels both broad and narrow that made up the earth’s interior. Dr. Edmond Halley , of comet fame, believed that all heavenly bodies were hollow and in a speech before the members of the Royal Society of London stated, beneath the crust of the Earth, which is 500 feet thick, is a hollow void. Next to carry the Hollow Earth banner was Captain John Cleves Symmes Jr. war hero of the War of 1812. 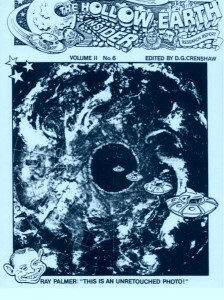 [Hollow Earth writings of John Symmes]. Once his studies led him to believe in a Hollow Earth, he used his knowledge to convince James McBride , a Miami Ohio millionaire. Mr. McBride used his political connections to Rep. Richard M. Johnson (D) of Kentucky [later vice-president under Van Buren 1837-18411] to petition congress to finance an expedition to claim the lands inside the earth for the U.S. The petition, by a vote of 56-46 was tabled and the minutes of this petition and vote are still archived in the Congressional Record . (3) * Watch the BONUS Video at end of report. Having read my fair share of science fiction, I’m familiar with Jules Verne and HG Wells who both had stories positing this..bubble…theory. I’ve also worked/played(music) on Bourbon St.(in the French Quarter of NOLA) and recall a shop across from one of the clubs I sang in. Among other things this “Old Time Photos” shop sold were geodes. Tourists would buy them as solid balls, most around the size of a baseball or grapefruit. Then the clerk would cut it open. There was always a void on the inner amythyst/crystal interior. These geodes were produced under volcanic conditions as a kind of bubble that was belched out of the magma then cooled, leaving a rough, gray rocky surface and an interior as I’ve described. Recently I’ve seen photos of crystal caves in Mexico where not only are the crystals enormous but the chambers they reside in are deathly hot. Special suits and very carefully monitored time frames are needed for exploring these caves. (that were once and will again be flooded/under water. The unsubstantiated theories of Verne and Wells posit a habitable interior. If the Mexican caves are any indication then the extreme temperatures they exist under would pretty much rule this out. On the other hand I have long been a caving enthusiast and have explored quite a number of them, (from Luray in my childhood, to Carlsbad, Mammoth, and perhaps most interestingly Cacahuamilpa in Mexico. One thing all these caverns had in common was a very pleasant/cool temperature. And of course some caverns (like Endless Caverns in the limestone regions of the Blue Ridge Mts. of Va.) truly are “endless”…or at least have not been totally mapped. It seems there’d be some sonographic means to determine the density of the planet (that humans have only scratched the surface of (relatively speaking). The Germans in the ’30s had some interest in certain mythologies regarding not just the “hollow earth” theories but also something called the “fire and ice” theories which posited the notion that (shocking idea) that we actually live on the inside of a bubble in a solid universe where other bubbles/civilizations exist but can only be found by burrowing not flying rockets into interstellar space. This is the kind of theory that would seem to have been throughly discredited via NASA etc. Still, for those who enjoy challenging everything they are taught…. I need someone to talk to. I feel like I’m going crazy. My dad’s retired airforce and told me some things I’m only now realizing support the existence of D.U.M.B.’s and at the very least the Drako’s. What is D.U.M.B. and what are the Drako’s? I’m asking because I met a woman who claimed to be half reptile and half human. She was running from the CIA and was camping in the middle of a National Forest up in Flagstaff. She had her own radio show and when I googled her name…OY! She was a millionare with homes all over the East Coast. I’ll be glad to tell you what I know. D.U.M.B. stands for Deep Underground Military Bases. According to their post, “These aliens are in command of the earth-based reptilians. The earth-based reptilians are in turn in command of the large greys who are in command of the small greys. They draco’s are interested in harvesting the earth’s resources, and insuring that these resources are efficiently exploited. It is rumored that the Draco reptilian species are involv ed in controlling human beings who hold high office and therefore, controlling institutions and financial systems.” To read full descriptions of each of the types of Drako’s and Reptilians read the complete report at http://tinyurl.com/7xntjjt. As for the woman you met in the campground. Did her last name start with ‘E’? Thanks for taking time to write. Come back often. I think you may have come to the right place. We invite you write up your (or your father’s) experiences and send them. just one quick thought: if the earth is hollow, how comes it wasn’t destroyed in the impact event that created the moon? or if it was and rebound due to gravity, well then it can’t possibly be hollow anymore now can it? or is the moon simply a captured object? but still, how comes that the earth survived any major impact if hollow, without cracking and breaking like an egg? If the earth (or any other body) is hollow with a thin shell, “eggshell like”, then yes, it would likely shatter into many, many pieces and implode due to a significant extraterrestrial impact (and we know there been at least several). However, if the void is comparatively small and at the center, with a lot of material between the impact and the void, then deformation wouldn’t necessarily collapse the void. In fact, it may increase its volume. Here’s why: the cumulative G vector at the center of the planet is 0.00000 G. The acceleration due to gravity at low earth orbit altitudes is about 8.5 m/s^2, but the speed of the satellite and its angular momentum match the earthly G forces. The highest G force in the immediate terran space is thought to actually be the zone about halfway between the center and surface of the planet, the same situation where we expect to find the densest material. Other planets and moons mileage may vary regarding highest mean density radius. When Newton’s apple fell, he realized that it wasn’t just the earth attracting the apple, they attracted each other. This where it starts getting a little weird. Depending on just how voluminous a void a body can support is directly tied to both the total mass and volume of the sphere (defines mean density), and the radius of the void. Tidal effects and other factors play in, but at very low levels. I would love to toss in a (few) Billy Mays “But Wait! There’s More!”, but I have errands to do right now. Rick – Your assessment of planetary composition is correct IMO. If gravity is a mass property (as mainstream physics claims) then at formation, the earths angular momentum would have caused the structure to form as shells of varying density with the densist layer existing well outside the actual center of mass. It is physically impossible for anything to be there. Evidence bolstering this theory range from the reverse teardrop shape of ore deposits (blob at the top, point at the bottom) to the anomalous nature of P-wave and S-wave readings at seismic sounding stations. Ironically, ONE model is proposed for seismic wave travel through the earth. These waves are pressure waves which transmit energy kinetically. The earths magnetic field is currently theorized to be as a result of the molten outer cores motion due to the correolis effect..a dynamo. These 2 models do not mesh yet both are considered correct by mainstream physics at the moment. If the core moves as proposed to generate the dynamo, the P-waves cannot propegate through the interior in anything close to the same vector line for any earthquake. Also, magma is less dense than rock…go figure. Thank you, Brent, for that comment. Yes, the “accepted science” is at odds with itself. I have an idea on how to film the hollow earth opening with a camera attached to a weather balloon. These balloons can climb up to 21 miles and can capture on film an amazingly wide area. . .and they’re fairly inexpensive! Recently I was using a portable lavatory at a renaissance festive. I saw something moving down in that dark-green fluid where human waste floats around. I think it was a portal to the inner earth place. But then I felt frightened and went running out of there as fast as I could. Trying to find those videos on conspiracy-hidden places are they still available or did they get banned, please let me know Dennis.Thanks sader5.